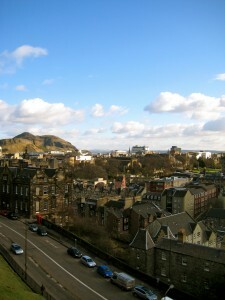 Well, I have officially been in Edinburgh for over a month, and days are starting to feel more and more “normal”. How funny, isn’t it, that a day in Scotland – thousands of miles from anywhere I have ever lived, or even traveled, before – could feel even remotely normal? Essays are starting to be due, laundry is piling up to be done, and I am even (finally) getting sleepy at the right time each night. Yes, indeed, there is normality in the air. This is the view of the city you get when you first enter the castle. It only gets better from there! This is the castle. 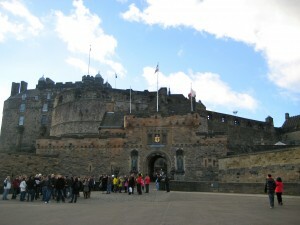 It’s one of the best-preserved castles in Scotland, considering most of them are in ruins. This is Mons Meg, it is a huge cannon that, when it worked (the barrel broke a long time ago), could fire a cannonball up to 2 miles away! 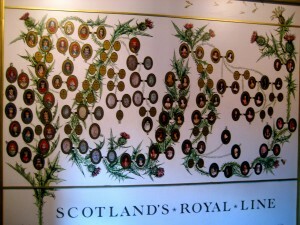 This was not at the castle, but still on the Royal Mile. 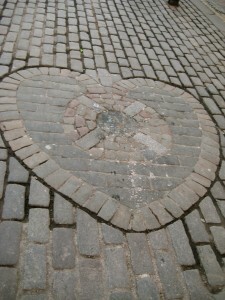 It’s the only place where it is legal to spit in Edinburgh… AND it’s a heart, just in time for Valentines Day! This weekend, I am going to Lindisfarne (the “Holy Island”). One of its claims to fame is one of the first copies of the Gospel printed in Britain (in the 1st century). I’m excited to see something so old! I’ve also seen pictures of it, and the scenery looks amazing! CORRECTION: My amazing Puget Sound Religion Professor, Greta Austin, corrected my above statement about the Lindisfarne Gospels. This is what she says, “the Lindisfarne Gospels are not from the first century CE but probably from the late seventh/early eighth century, and of course they were not ‘printed’ but rather ‘made’ or ‘produced’ (by hand)”. I’m also in the process of writing my first essay for my Celtic Civilisations class. Essay expectations are so different here… they are much more resource focused, and you can lose major marks for not citing your sources correctly. The spelling is, of course, different as well. I don’t think my Celtic Civ. professor is as strict about using the UK spelling (glamour instead of glamor, realise instead of realize, etc. ), but I’m still going to try to spell everything in the un-American way. The weather has leveled out at a pretty constant 40-degree high every day, the days are starting to get longer (the sun sets around 5:30p now), and I saw the first bulbs poking out of the dirt yesterday. How very exciting! Other signs of spring? Spring Break, of course!! I think I mentioned our travel plans in my last post (London, Rome, Prague, Vienna, Munich, and Paris), but we have now officially booked all of our trains/planes/buses and hostels for the trip. Now comes the fun part: figuring out what we are going to do in each city! 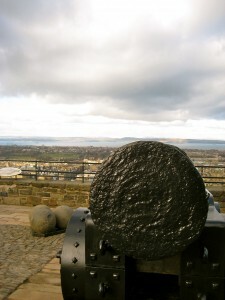 This entry was posted in Alayna Schoblaske '10, Scotland and tagged Edinburgh Castle, essay, normal, Spring Break. Bookmark the permalink.